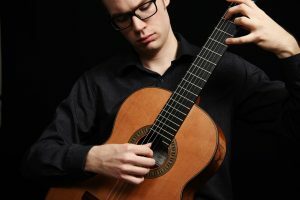 Featured as one of CBC’s “30 Hottest Canadian Classical Musicians Under 30 in 2018,” Nathan Bredeson is gaining international acclaim as an award-winning guitarist and a composer. He earned his bachelor of music at the University of Ottawa where he studied under Canadian Guitar Quartet founding member Denis Donegani, and composition with John Armstrong and Frederic Lacroix. Nathan was awarded the Ed Honeywell Memorial Scholarship for classical guitar in 2013. His studies with Denis laid the foundation of his musical voice: a versatile approach to interpretation that balances passion and expressiveness with semaphores within the music and tasteful observation of style. The final product is a powerful yet graceful approach to musicality that has delighted many an audience. Nathan went on to complete his masters degree under the tutelage of the Cuban guitar virtuoso Rene Izquierdo at the University of Wisconsin Milwaukee. Under the watchful eye of Maestro Izquierdo Nathan refined his guitar technique and interpretive voice to reach a level of accuracy and expressiveness that has seen great success on both the concert stage and in competition settings. 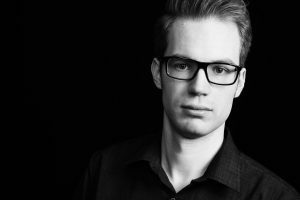 Nathan enjoys performing solo works as well as in guitar ensemble and mixed ensemble situations, with a special interest in music of the Baroque and the 20th and 21st centuries. He is particularly fond of performing for audiences unfamiliar with guitar to bring the beauty and richness of the instrument to fresh ears. His participation in the 2014 premier of Christine Donkin’s Lacus for ten guitars and string ensemble with the Ottawa Thirteen Strings Chamber Orchestra awakened an interest in supporting the writing and performance of new guitar works as well as writing works for his colleagues. In 2017 Nathan joined with Alexandre Bougie and Francois Lacelle to form the Ottawa guitar trio, a dynamic ensemble dedicated to introducing listeners to the beauty of the classical guitar through classical music, as well as arrangements of music from TV, film, and video games. Alongside performance, Nathan has been an active participant in national and international competitions for guitar as well as composition, and has placed in several competitions across Canada and the United States. His solo piece Astral Projection took first prize in the Ottawa Guitar Society Composition Competition in 2016 and was premiered by Daniel Ramjattan at the 2017 Guitar Alla Grande Festival in Gatineau, QC. Nathan currently teaches guitar and music theory for Ottawa Suzuki Strings. He is also proud to play on a 2015 cedar-top guitar built by Vicente Carrillo. You can visit his YouTube channel here. Nathan is available for performances and events such as weddings, formal dinners, and funerals. He is also available for teaching beginner to advanced students for guitar and composition and for commissions of compositions or arrangements. If you would like to contact Nathan about availability, email him at [email protected]. What do people have to say about Nathan?